Ginger ale is a carbonated soft drink flavoured with ginger in one of two ways. The golden style is credited to the American doctor Thomas Cantrell. The dry style (also called the pale style) is a paler drink with a much milder ginger flavour, and was created by Canadian John McLaughlin. Thomas Cantrell, an American apothecary and surgeon, claimed to have invented ginger ale in Belfast, Northern Ireland, and marketed it with local beverage manufacturer Grattan and Company. Grattan embossed the slogan "The Original Makers of Ginger Ale" on its bottles. This was the older style Golden ginger ale, dark coloured, generally sweet to taste, with a strong ginger spice flavour. Ginger ale is clear; ginger beer is often cloudy due to the residues of brewing, and has a stronger ginger taste. Dry ginger ale is recognized as a Canadian creation by John McLaughlin, a chemist and pharmacist. Having established a soda water bottling plant in 1890, McLaughlin began developing flavour extracts to add to the water in 1904. That year, he introduced "Pale Dry Ginger Ale", the bubbly libation that would be patented in 1907 as "Canada Dry Ginger Ale". An instant success, Canada Dry products were accepted by appointment to the Vice-Regal Household of the Governor General of Canada. The dry-style also became popular in the United States during the Prohibition era, when it was used as a mixer for alcoholic beverages. Dry ginger ale quickly surpassed golden ginger ale in popularity. Today, golden ginger ale is an uncommon, more regional drink exemplified by Vernors. By contrast, dry ginger ale is produced on a large scale internationally, and is a staple in supermarkets and bars, and on airlines. 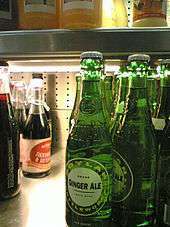 Ginger ale commonly contains carbonated water, sugar or HFCS, and artificial or natural ginger-flavour. Ginger content is often listed on labels in a general "natural aroma" or "Natural flavoring" statement, to preserve secrecy of the complex proprietary mix of spices, fruits and other flavours used. Lemon, lime, and cane sugar are the most common of ingredients. Pineapple and honey are also occasional ingredients. Ginger ale can also contain yeast, when carbonated with natural fermentation. Most commercial ginger ales made in the United States are made with high fructose corn syrup as a sweetener. It is popular in mixed drinks, and punch, and it is sometimes used as a non-alcoholic substitute for champagne or beer, since the beverages resemble each other in appearance. Ginger ale can be mixed with many hard liquors, beers and wines. In Jamaica, a common way to consume ginger ale is mixed with Red Stripe beer; this is called a Shandy Gaff. Dry ginger ale is also sold with a mint flavouring added. Some mint ginger ale brands have an artificial green colour added, while others are clear. Recently, Canada Dry has introduced a line of ginger ale mixed with green tea. In selected Japanese vending machines, Canada Dry also offers hot ginger ale, which is simply the heated version of the original but still retains carbonation. Vernors, Blenheim, A-Treat, Bull's Head, Chelmsford, Buffalo Rock, Sussex and Red Rock are brands of golden ginger ale. Canada Dry, Schweppes, and Seagram's are major brands of dry ginger ale. Brands available in North America include Canada Dry, Bull's Head, Canfield's, Bruce Cost Fresh Ginger Ginger Ale, Hansen Natural, Vernors, Seagram's, Seaman's (acquired by PepsiCo and now discontinued), Schweppes, Sussex, Buffalo Rock, Boylan Bottling Company, Polar Beverages, Ale-8-One, Blenheim, Foxon Park, Fitz's, Sprecher, Vally, Market Basket/Chelmsford, Red Rock, Reed's Ginger Brew, Thomas Kemper, Blaze (produced by Pipeline Brands), Chek (River of Dreams), Shasta, Northern Neck, and Sussex Golden Ginger Ale. Vernors is a flavoured golden ginger ale aged for three years in oak barrels before bottling. 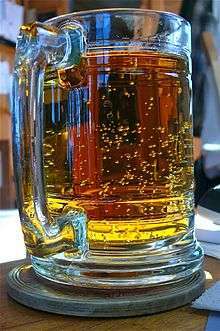 It was the first U.S. soft drink, originating in 1866, although it was modelled on imported Irish ginger beers. In Detroit, Michigan, a drink made with vanilla ice cream and Vernors ginger ale is called a Boston cooler. Blenheim is a golden ginger ale made in South Carolina; unlike most other brands, it is available in several degrees of spiciness: Old #3 Hot, #5 Not as Hot, and #9 Diet. ↑ "Federation of Historical Bottle Collectors" (PDF). FOHBC. Retrieved 2013-10-03. ↑ "Canadian food firsts". Canadian Geographic. January–February 2002. Retrieved October 31, 2012. ↑ "brews | Reeds, Inc.Reeds, Inc". Reeds Inc. Retrieved 2013-10-03. ↑ "Drinks containing Ginger Ale. Choose from 234 drink recipes containing Ginger Ale.". Bar None Drinks. Retrieved January 5, 2013. ↑ "Products « Blenheim Ginger Ale". Blenheim Ginger Ale. 2013-08-13. Retrieved 2013-10-03. Look up ginger ale in Wiktionary, the free dictionary.